Friday the 28th Brother Graham and I will sit in with the Soft White Sixties at the Chapel. The show is sold out, but come say what’s up if you’re there. Sunday March 2nd The Town Quartet will play our regular gig at the Musical Offering Cafe and Bistro. Right now the plan is to do Saint-Saens in Smetana without a break and Mozart Dissonance. We’ll see if that holds up. 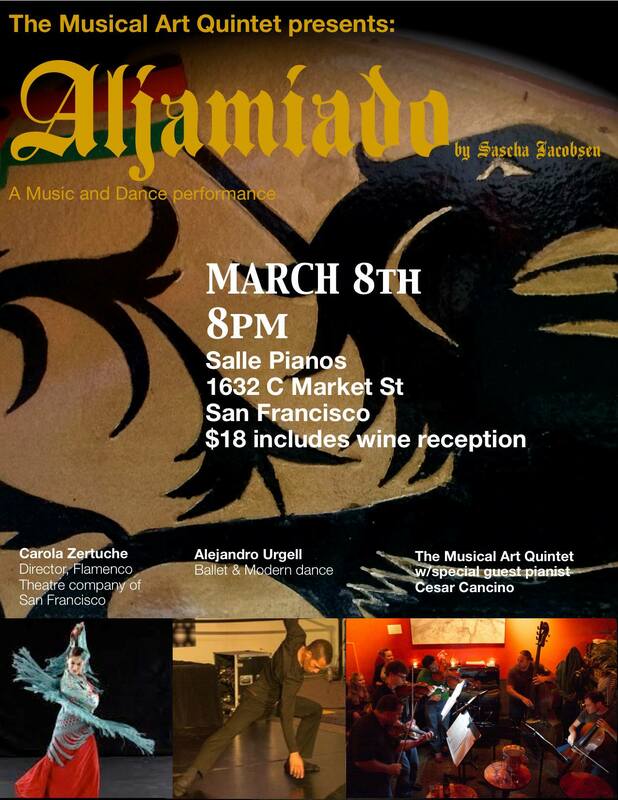 Saturday, March 8th, is the world premiere of Sascha Jacobsen’s ballet, Aljamiado, at Salle Pianos. Pianist Cesar Cancino will join the Musical Art Quintet, and we will feature some amazing dancers, including my bud Alejandro Urgell. Very inspiring! Tuesday March 11th we will do our 2nd Classical Revolution show at Caffe Trieste in Berkeley at 7. When that’s over I recommend heading over to Brick and Mortar in SF, where the Telegraph Trio will play. Word on the street is we will play rock music. Cash Pony is also playing. Come, hang out, make merry! 2/28 Soft White Sixties at the Chapel. 3/8 Musical Art Quintet at Salle Pianos. 8pm, $18 includes wine reception. 1632 C Market St. San Francisco.